200 delicious, fun, and easy vegan recipes for you to explore plant-based eating in a guilt-free, judgement-free way—perfect for new vegans, flexitarians, and curious carnivores. Where do vegans get their protein? What can you possibly eat that doesn’t have milk in it?! Don’t vegans only eat spinach and weeds? Won’t it taste horrible? For many, the vegan diet is as intriguing as it intimidating. Some want to dip their toes into veganism first, testing the waters before deciding to make the change to a completely vegan lifestyle. Others know it’s a great way to incorporate more plant-based meals into their diets, but don’t want to lose the delicious comforts of ice cream, cheese, or fried chicken. That’s where Kinda Vegan comes in—it’s a no-nonsense guide to being vegan-ish. Restrictive dieting be gone, with Kinda Vegan you can go meatless on Monday, then enjoy a juicy steak dinner on Tuesday with no judgement! In this fearless guide to the seemingly complex world of no-meat, no-eggs, no-dairy, you will discover how to go vegan without feeling any pressure whatsoever. You can have your cake and eat it too. And your sweet ice cream. And your delicious cheesy flavor. All you need are some conscious shopper skills and the quick, go-to information found in this book, including a guide to the essential foods to have in your pantry. From grains and lentils to maple syrup and dairy-free milk alternatives, there are tons of delicious vegan ingredients to enjoy. No weeds here! 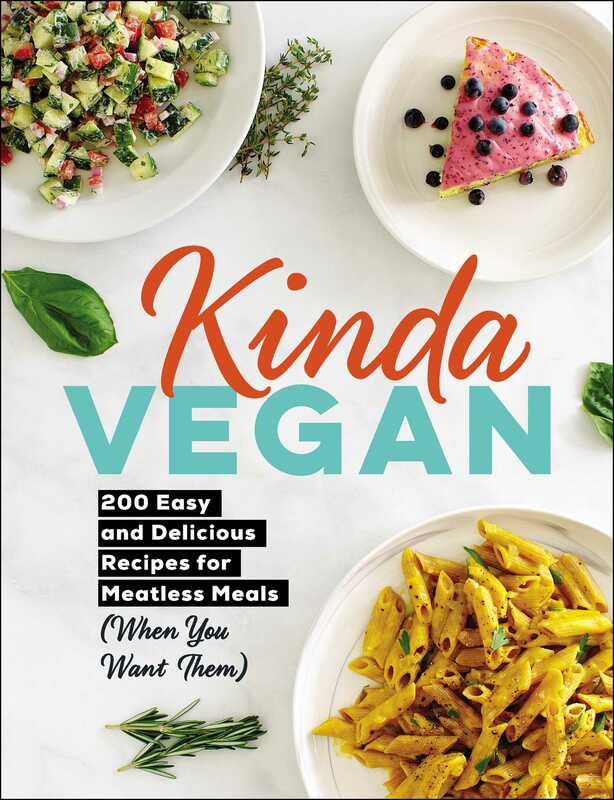 Kinda Vegan includes 200 easy recipes that are so tasty you won’t believe they’re vegan. It’s easy to make a vegan meal—or day of meals—whenever you want. Hearty breakfast dishes like crepes and blueberry muffins; international bites like Mediterranean falafel and Chinese fried rice; and guilt-free desserts like chocolate mocha ice cream and pumpkin bread may just have you wanting to go vegan all week! Not the best at planning meals? Don’t sweat it: the book also included an appendix of vegan meal plans. You can plan out a few days of meals in minutes, or flip to a meal plan whenever you are out of ideas or just don’t have the energy to decide what to eat that day. Whatever your reasons are for ditching meat, and whatever your schedule and taste buds desire, Kinda Vegan makes being vegan-ish a snap! "With increased awareness of how food production impacts climate change I’m seeking out new ways to add vegetable-based meals to my repertoire that are tasty and easy to pull together. I can’t wait to make the Easy Black Bean Burgers and the Eggplant Puttanesca from this pick, out in January." "For meal prepping inspiration and a leg up on knowing what to cook, find healthy and vegan meal inspiration in the new Kinda Vegan."